Seth Bayles made a trip to Rochester on Monday, but it wasn't for treatment at Mayo Clinic. Instead, he was there to donate pop tabs he'd collected for the Ronald McDonald House, where he and his family often stay while in town for care. Seth Bayles thinks big. When he heard that the Ronald McDonald House of Rochester — where he and his family often stay while he receives care at Mayo Clinic — was launching an expansion campaign, Seth wanted to help. So the 16-year-old decided to collect pop tabs for the cause. A lot of pop tabs. One million, in fact. And on Monday, he delivered that and more. 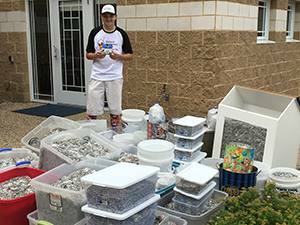 Seth exceeded his original goal by some 685,110 tabs, which will be recycled and turned into cash for the Ronald McDonald House. "It felt amazing," to reach his goal, Seth tells us. 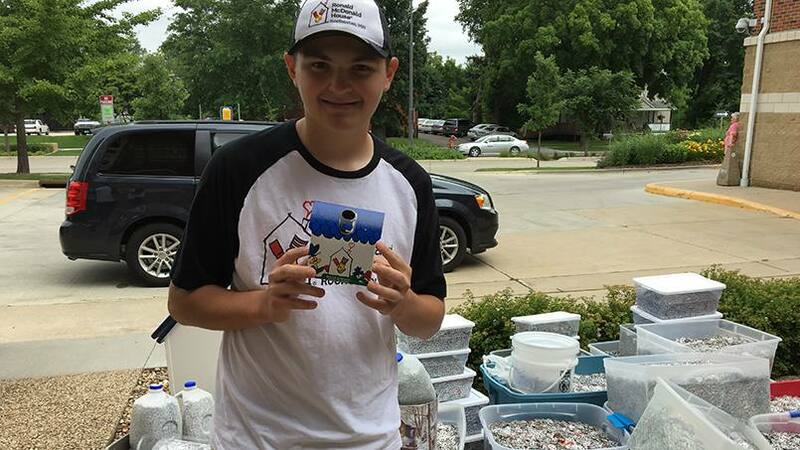 It took Seth less than two months to collect all those aluminum gems, thanks to the power of social media and the support of his hometown of Bristol, Wisconsin — population 4,000 — which embraced Seth's cause as their own. "When people come together, it's amazing what can happen," Seth's mom, Julie Bayles, tells KAAL-TV. The Bayles family made the five-hour trip to Rochester to deliver the tabs on Monday, July 10. It's a route they know well, having driven it countless times since 2009, when Seth first came to Mayo Clinic and was diagnosed with an autoimmune disease so rare that it doesn't have a name. Or a cure. "I know what it feels like to need this house," Julie told the crowd of well-wishers who assembled to congratulate Seth and celebrate his donation. "We don't want people to be turned away. We want people to experience what our family has." Seth's donation, which was the largest of its kind for the Ronald McDonald House of Rochester, isn't his first effort to help the place he calls his second home. He also made a large donation of pop tabs to the house back in 2014. And last year, to mark his 16th birthday, Seth launched a supply drive for the house. It probably will come as no surprise to hear that Seth plans to continue collecting pop tabs. And he's hoping others will join him. If you're in Rochester, you can drop tabs off at various vendors this week during Thursdays on First & Third. Take-home collection boxes also will be available. "This isn't just Seth's project," Julie says. "Anyone can do it. Everyone can make a difference." You can make a difference by leaving a comment below before you use the social media tools to share this story with others. And you can keep up with Seth (and his good works) on the Seth's Journey Facebook page.